The bread was what first drew me in, beautifully painted bread – and superbly painted, expressive hands, raising up the loaf. I thought again about how intimate hands – and feet! – are to us, to our very beings, articulations of body and spirit coming together in their movements and gestures. I find myself very moved by depictions of hands and feet. A few weeks ago my husband and I visited Loreto in Le Marche, Italy, on a hillside high above the Adriatic Sea, just south of Ancona. The basilica there, the Basilica della Santa Casa, or Shrine of the Holy House, is one of the most popular Marian pilgrimage sites in Italy. Rebuilt inside this glorious late-Gothic sanctuary is a smaller, more humble dwelling that many believe to be Mary’s original house from Nazareth. Around the precincts of the basilica I was immediately drawn to large posters reproducing a somehow muted but warmly glowing painting of a crusty, broken loaf of bread elevated by hands not young, not gnarly with age, but everyday hands, beautiful in their ordinariness, golden wedding ring on the left one, all announcing an art show. 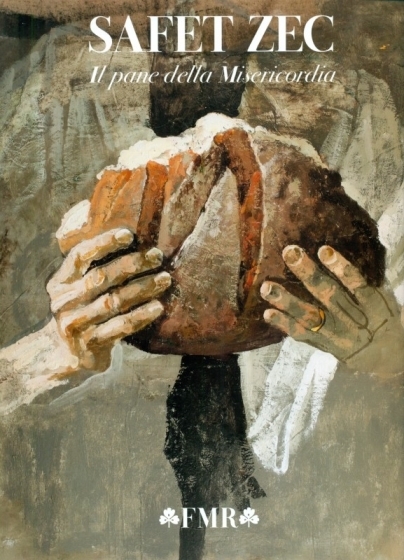 As I finally took time to read and translate, I saw: Safet Zec: Il pane della Misericordia (Safet Zec: The bread of Mercy). In my very limited Italian I began to realize that this was one of several current art exhibits in Le Marche in honor of the Pope Francis’s declaration of 2016 as a Jubilee Year of Mercy. I later discovered that Safet Zec is a Bosnian artist now living in Venice. The day we visited the exhibit we had begun with a tour of the high ramparts, a unique feature of the Loreto basilica which is a combination of a church and a castle, as attacks from pirates and Saracens (Muslims) had always been feared. There are glorious views from that guards’ walk above, but the depths of the basilica were equally stunning, as we learned, when we entered the Safet Zec exhibit in the ancient wine cellars far below. And so the bread… painting after painting of crusty bread that seemed almost real, often broken, or at least creased in the baking. I would not have been surprised to catch the aroma of it wafting through the brick-arched rooms of that wine cellar way down below the area most of the pilgrims were visiting. There were also numerous scenes of simply-set tables, bunches of red onions, heaps of potatoes. Someone describes Zec’s paintings as having sepia tones, but it’s more than that: with thick, painterly brush strokes his paintings glow. The brown tones of the bread have hints of warm red; the whites of robes and table linens gleam. What light! Interspersed with the earthy, homely paintings of food and meals were, of all things, paintings of Christ’s deposition from the cross, full of the movement of living hands and Christ’s limp hands and vulnerable feet. What eventually struck me most was a hand tenderly cradling Christ’s head. This hand reached all the way around and under his head, covering the left corner of his mouth and his nose in its handling, but with such love and respect. ‘Abbracio’ was another one of the themes that began to emerge: an embrace, a clasp, a hug. Christ’s deposition as abbracio – that was a new thought to me. His hands that had washed the disciples’ feet, broken the bread at their last meal together, his arms on the cross that had been spread out in a painful and loving abbracio: now his disciples embracing his dead body and bringing it ‘down to earth’ from this wooden frame. The paintings in the exhibit began to come together: bread, hands, meals, feet, the cross, the embrace… mercy, deep mercy. The bread of mercy, Christ’s body broken for us. But there was more. Faces began to be added in, faces aged by conflict and suffering. Zec had had to flee Bosnia during the war, but has these faces impressed on his being. What I realized when I got home and looked again over the pictures I had taken was that the faces resembled, in the most beautiful way, loaves of bread as well. Creased, elderly and in pain, one in particular running with tears, yet in the faces of war’s broken victims the same warm tones of bread were reflected, somehow instilling a sense of hope and love, our human being caught up into Christ’s body, the bread of the world. The echoing of pictures and themes, bread and body, between the opposing walls and in intimate spaces, it was as though we found ourselves in another dimension of the Eucharistic sacrament, taking in the infinite mercy of Jesus Christ and being thankful. Safet Zec: Pane nella mano / Bread in the hand, 2016, tempera and collage on paper on canvas, cm 60 x 50. Poster of the Safet Zec: Il pane della Misericordia exhibition, Loreto, 2016. 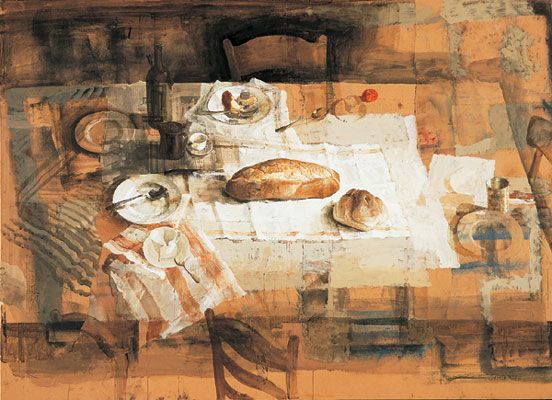 Safet Zec: Grande tavola / Large Table, tempera and collage on paper on canvas, cm 160 x 220. 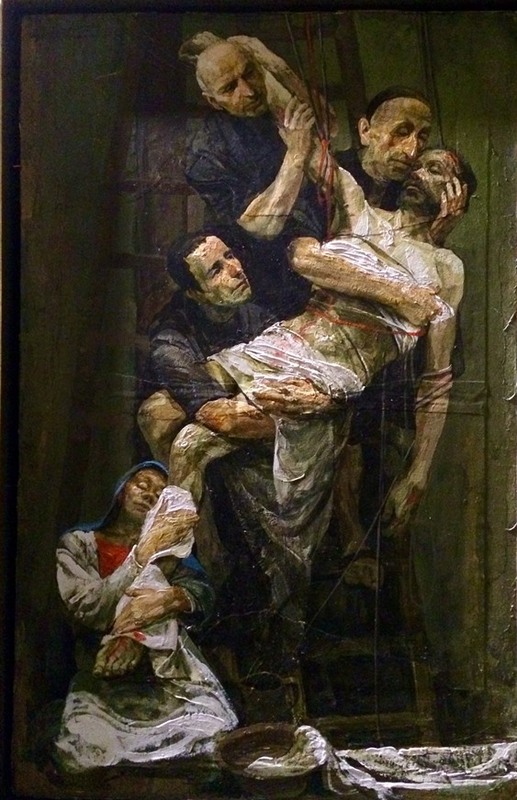 Safet Zec: Bozzetti per la Deposizione / Sketches for the Deposition, 2013-2014, tempera and collage on canvas, cm 50 x 70. 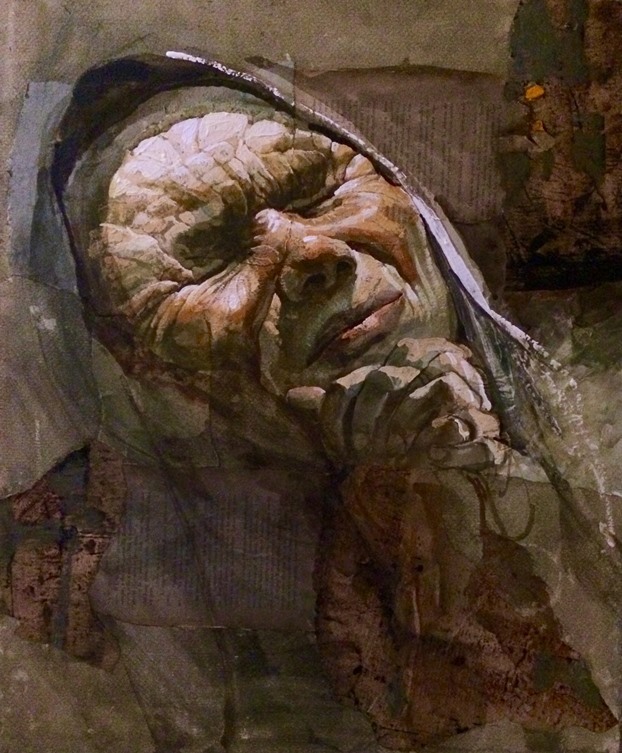 Safet Zec: Viso di donna o Grido / Face of a Woman or Cry; tempera and collage on paper on canvas; cm 60 x 50. Safet Zec (b. 1943), a Bosnian-born painter, engraver and proponent of 'Poetic Realism', fled his homeland during the war in 1992 and resettled in Italy. He currently spends his time between Sarajevo, Pocitelj, Venice and Paris. Zec often paints with tempera over newspaper collages attached to canvas, bringing typeset words and photographic images to the immediate backgrounds of his painterly works. Also known for his painting of windows, he once said, 'Painting windows is like painting a portrait for me. They are like people, they change their aspect as the day and night passes. They're ever present in our lives'. See an article by Shelton Lindsay at https://theculturetrip.com/europe/bosnia-herzegovina/articles/haunted-by-war-the-art-of-safet-zec/.